MCR Safety stocks a variety of ANSI 107 rated safety vests for your high visibility needs. With an assortment of styles and colors, you can choose a garment that ensures that you show up in a variety of complex backgrounds. It can be a matter of life or death, so be seen in MCR Safety's Hi-Vis apparel. 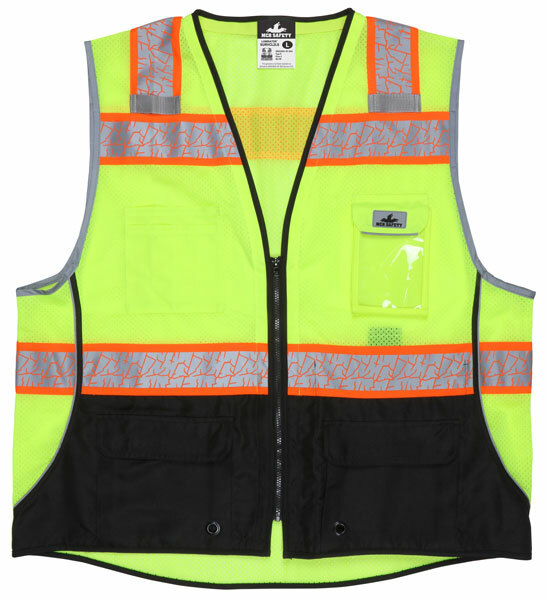 The SURVCL2LS is an ANSI/ISEA Type R, Class 2 safety vest made of fluorescent lime polyester mesh material that keeps the wearer cooler in warm environments, and a heavy-duty solid shaded material on bottom front to hide soiling. It features Patent Pending 2” Silver Force Flex Reflective material on 3" Orange Contrasting Trim, reinforced zipper, and 4 outer - 2 inner pockets. Other features include a clear badge holder, 2 mic-tab holders, surveyor tape dispenser slots in lower pockets, and is trimmed with reflective piping to help outline the torso in low light environments. Be seen in the best; be seen in MCR Safety’s Premium Hi-Visibility products.